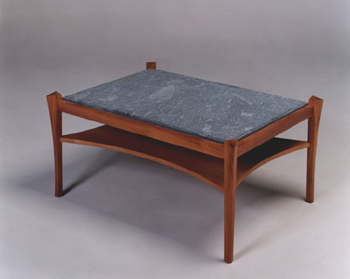 Roger wanted a stone-topped table with design details that rhymed with his frame and panel bed frame. We went to a stone supplier and Roger found a gorgeous piece of Italian slate that complemented the woods from his bed frame. The table legs have a similar faceted shape to the bed frame posts, and the lower shelf is banded on its edge with the same anigre wood as the panels for the bed frame.